• Removal of riparian vegetation, and streambank destabilization. These factors lead to economic inefficiencies, including higher water treatment and delivery costs, more water use restrictions, enhanced drought and flood risk mitigation efforts, and costs associated with avoidable water-related disasters. These factors also degrade entire ecosystems and the overall environment through the loss of instream habitat and increased numbers of Threatened and Endangered Species. Improving water quality in a stream or river is complex. Most often, many different issues combine to impair water quality and stream health and such conditions can vary widely throughout a stream system. High quality and detailed data is fundamental to understanding the current conditions and issues in any river or stream corridor. Such data is critical to applying an integrated planning and management framework for prioritizing and implementing remediation plans. The new High Definition Stream Survey (HDSS) method is a much faster and more cost effective way of collecting this data. HDSS involves collecting continuous visual and numerous other data points over long (many mile) waterway segments. 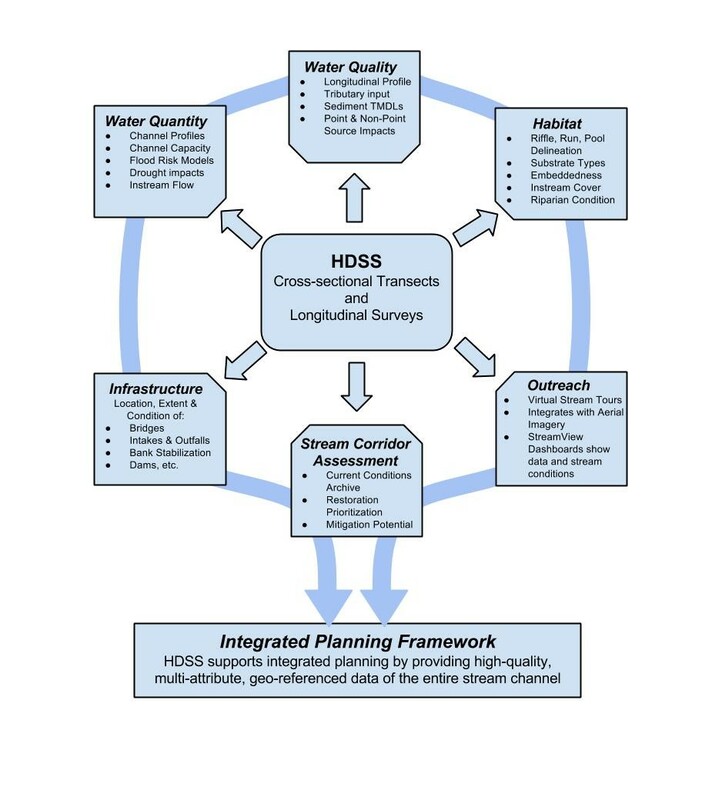 The results of an HDSS effort are highly valuable for stream channel assessments, water quality and quantity studies, habitat assessments, community outreach and overall integrated watershed planning (Figure 1). Figure 1. The application of the HDSS data to multiple different water management issues and its use in an integrated planning framework. In contrast to the continuous coverage of long stream segments provided by the HDSS approach, traditional stream sampling surveys are based on point samples or descriptions of short sections of streams or rivers. These traditional methods collect information on a small percentage of total aquatic habitats and then extrapolate the findings between sampling sites to fill in the gaps. It is not uncommon for a few-hundred-meter survey site to be considered representative of 20 or more miles of adjacent stream. Extrapolation of data is a major source of error and will completely miss problems if the problem areas fall outside of a sample location. 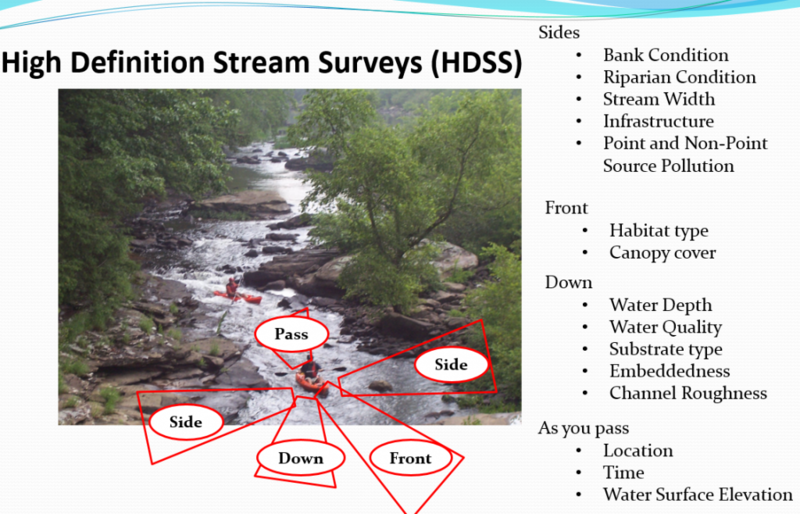 The HDSS method avoids the problems of data extrapolation by collecting a continuous survey of the entire river segment allowing the location, extent, and intensity of problems areas to be accurately identified (Figure 2). Figure 2. An example of good and bad streambank conditions. These two sites are located about 1 mile apart on the Big Canoe Creek, AL. These images highlight the variability of conditions throughout a stream and the difficulty of choosing a sampling location that accurately reflects stream conditions as a whole. The heart of the HDSS method is the ability to gather a wide range of stream corridor data at a consistent spatial resolution (Figure 3). This means that documentation of stream corridor conditions is rapidly and consistently applied to very long stream segments which results in continuous measurements. Traditional survey methods focus on collecting highly detailed measurements at one location, but ignore information for miles in either direction. The HDSS method not only delivers a more complete data set than traditional surveys but is also much more efficient, as fewer people can be used to capture data more quickly along longer portions of a stream. The HDSS methodology can capture data in wadeable and non-wadeable streams, providing more consistent and broadly applicable results while still collecting the data at a greater speed. Figure 3. HDSS gathers information from the front, both sides, and down while recording time and location every second. This rapid approach provides consistent spatial resolution data for long stream segments and is far more efficient and effective than traditional transect approaches. The HDSS method is an outgrowth of research efforts developed at the University of Tennessee. The rapid, multi-attribute, geo-referenced techniques have been tested and used for delineation of streambank erosion potential (Connell 2012), development of sediment TMDLs (Hensley 2014), mapping of aquatic habitats (Candlish 2010, McConkey 2010, Connell and Parham 2015), comparing thalweg and cross-sectional transect approaches (Swinson 2012), and prioritizing restoration areas (Connell and Parham 2014). The method has been used successfully on numerous streams and rivers including Big South Fork River, TN (McConkey 2010), Obed River, TN (Candlish 2010), Beaver Creek and the New River, TN (Connell 2012), Paint Rock Creek, AL (Connell and Parham 2014), Bear Creek, AL (Connell and Parham 2014), Turkey Creek, AL (Connell and Parham 2015), Manoa, Palolo, Makiki, Waiawa and Iao Streams, HI (Parham 2015) and many others. The HDSS method follows a standardized process that promotes rapid, systematic collection and processing of large amounts of river condition information (Figure 4). The specifics of the data collected can be customized to meet a project’s requirements, but following the basic HDSS process ensures a successful project. Figure 4. Standard HDSS project flow chart. Systematic data collection and processing supports high quality project results. HDSS provides powerful insights into the current conditions of a stream or river and is a more effective approach to documenting stream corridor conditions than traditional sampling approaches. HDSS provides the data necessary to improve water resource planning and management.